just a general question if anyone had some success getting Palemoon to work. I've tried to get the Linux version running, though directly after starting it hangs. Compiling it directly works using GCC5, though again it directly segfaults upon starting it. The truss output loops with a "getpid" call, till a segfault ends the process. Did anyone had some more success ? Ccache isn't used. Also trying with an older 26.x version wasn't more successful. Though, maybe they changed too much being Linux centric so it isn't possible at all. Finally, Pale Moon 27.6.0 is available for FreeBSD. See PR 223597 for further details. and main desktop OS. I aslo tried to use it with "linuxulator", and to build it from source, but without any luck. pre australis UI... Also it is very lightweight (without many unnecessary FF features) and very fast. compatible) FF extensions with PM. I'm writing this post from PM right now and I can confirm that it's working fine. Attaching complete palemoon port, for those who do not want to create it from patch from post above or to wait. I used it to build PM, that I'm using now. Just extract palemoon dir to /usr/ports/www/, # cd into it and run # make install. as a workaround, install this addon, then open its settings and tick "Set as default cookie manager"
under "General" tab. This solves the issue. To use developer tools (F12), install — Developer Tools. Why can't it be installed from pkg install_name package? It takes a long time to compile from the tedious ports. I built it tonight on my T61 with Intel Core 2 Duo T7300 @ 2.0GHz and 4GB RAM in 65 minutes using the .zip file ILUXA provided with no problems. It has the extensions available for it I was missing in the new version of www/firefox and I'm pretty happy with it at this point. Edit: It complied without issue on my X61 running FreeBSD 11.1-RELEASE-p4 as well. Why can't it be installed from pkg install_name package? Because it hasn't been added to the ports tree yet. I built it tonight on my T61 with Intel Core 2 Duo T7300 @ 2.0GHz and 4GB RAM in 65 minutes using the .zip file ILUXA provided with no problems. I left it compiling palemoon in the night, ending up giving error, it was not installed palemoon. What a new and buggy application. Which is why it hasn't been added to the ports tree yet. But I tried to install the package from the ports directory as it says ILUXA, and it gave me error. For me, and it seems for some users (23), it is working fine. Better check your /etc/make.conf. No, I'm not doing anything wrong, I try to do as you say, and compilation ends in that mistake. In the /etc/make.conf file I only have enabled USE_GCC=any so that the gcc compiler works in some application that needs gcc. That's your mistake then. Remove it and try again. In the /etc/make.conf file I only have enabled USE_GCC=any so that the gcc compiler works in some application that needs gcc. Never add any USE_* variables to /etc/make.conf. They don't belong there. I can't remove it, because if I remove it USE_GCC=any, wouldn't work Xorg, and in virtual machine QEMU the Xorg would give me as corrupt and I wouldn't load Xorg. 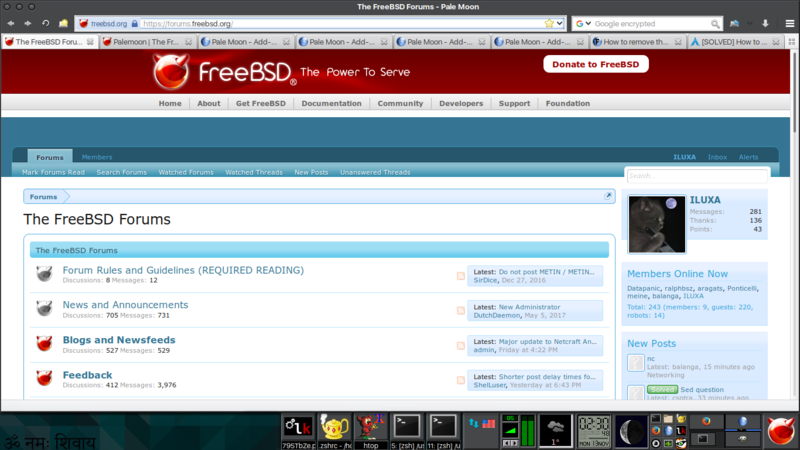 So spectacular that FreeBSD works in Qemu and goes great. The Xorg in Qemu compiling with clang recognizes it as corrupt, and does not load Xorg, and so add USE_GCC=any to /etc/make.conf so that the gcc compiler compiles Xorg in clean and loads Xorg for machine displayed in qemu. OK, but globally using USE_GCC=any is a mistake especially for C++ applications/libraries (LLVM's libc++ is incompatible with GCC's libstdc++). Do you know what port the bug is actually in? Is it x11-servers/xorg-server? You can create /usr/ports/x11-servers/xorg-server/Makefile.local and add USE_GCC=any to it. Just for the ports that needs it and not every port. The bug you describe is tracked in PR 202643 and there seems to be an alternative solution there. I thank you for your reply, very kind, but in that link you give me there are so many answers from users that I don't know which is the right one to follow, it's quite confusing. What I want is for the gcc compiler to only compile the dependencies that depend on gcc, and everything else will normally compile the clang compiler that is supplied by Mac OS X. Maybe you can help me figure out how to proceed and correct that flaw. I extracted a palemoon directory from the .zip file ILUXA provided into /usr/ports/www and ran make install clean without specifying any non-standard options, twice, with success on both machines. # settable options. ([b]Setting USE_* in /etc/make.conf is always wrong[/b]). # settable options. (Setting USE_* in /etc/make.conf is always wrong). And maybe an idea to put some variable in another file that depends of the gcc compiler? The FreeBSD system runnin in Qemu like an airplane and I don't want to spoil it, the sound is crisp, the video is clear, the screen is full and the speed of the system is spectacular. 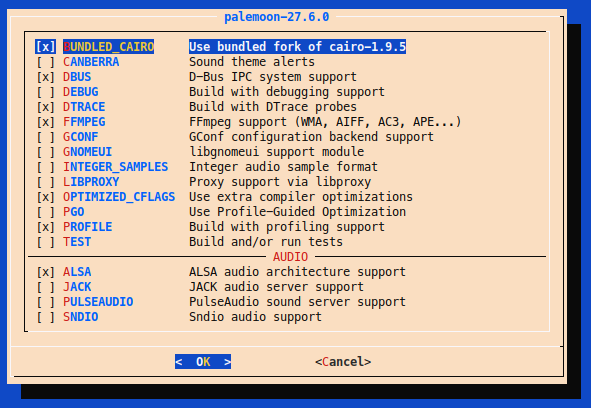 Do not know, I had no problem with building palemoon in FreeBSD 11.1-RELEASE-p4 also. I'm rebuilding it now again to be sure it 100% works. I had problems with sndio in PM, so I use alsa and it's working fine. Thanks for confirming, ILUXA ! Just in case I tried your /etc/make.conf (although it doesn't have anything specific) without success.